Once upon a time, it was a nice sunny day in Chicken Nugget Land. But that night it became stormy with thunder and lightning. Turkey Leg the Chicken Nugget was watching television in his house when the electricity went out. Turkey Leg was both scared and annoyed. “What the heck is going on?” he said to himself. He went to the window and looked outside. It was very dark. Turkey Leg went to the kitchen to find his torch in the junk drawer. It was hard to see in the dark but he found it. Turkey Leg went to the door and flashed his torch. He thought he saw something, but he wasn't sure. He went to the back door and went outside. Suddenly, he blacked out. When he woke up, Turkey Leg found himself face to face with Big Nugget. 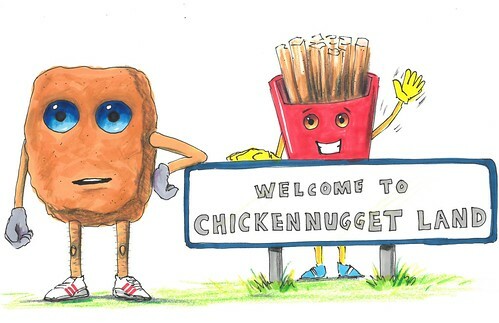 Big Nugget was the cruel leader of Chicken Nugget Land. “Why did you bring me here?” Turkey Leg exclaimed. 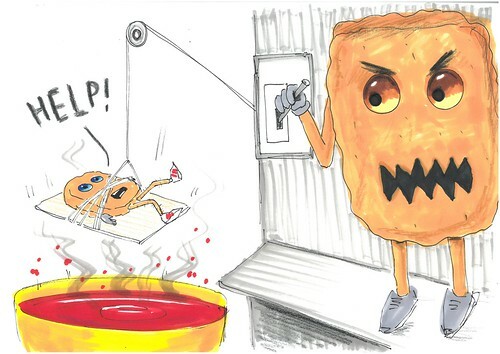 “I brought you here because you have something of value to me,” said Big Nugget, grinning. Turkey Leg looked down and saw that he was being lowered into a big bucket of red stuff! Meanwhile, Turkey Leg’s best friend, Chippy the Chip, was looking for him. She had found a note in Turkey Legs house that said.